Our extensive financial, transactional, and technical experience allow us to advise our clients on industry-standard best practice in the Corporate Real Estate space; from BOMA and IFMA to IFRS and FASB lease requirements. By guiding our clients through process optimization, we are able to gain efficiencies and enhance business workflow - using our technology expertise to meet evolving needs. As a technology - focused consulting firm with experience in multiple software disciplines, we are able to help our clients select the best software for their current organization and projected Real Estate requirements. Tjene consultants excel at redesigning processes for efficiency and encouraging harmonious change throughout an organization. As technology and business requirements advance over time, technology implementations continue to grow in scope and complexity. As a result, implementation teams may have difficulty in identifying and understanding the desired end product. Teams – We focus on providing localized and dedicated teams to serve our clients. Through our experience, we have learned that cross-functional teams can work as a single, cohesive unit while maintaining steadfast client communication, resulting in a lower need for overhead management. Approach – We recommend and subscribe to an Agile model for greater client partnership and successful technology implementations. At the onset of a project, our project team will work with the users to identify and prioritize all critical items. The team will split critical items into small, manageable sprints in order to quickly and frequently develop new prototypes that can be reviewed with the business users. At the end of each sprint, our team will review the prototype, identify areas of improvement, and re-prioritize task items for subsequent sprints. A successful deployment is only the first step towards the enterprise-wide adoption of a new software solution. 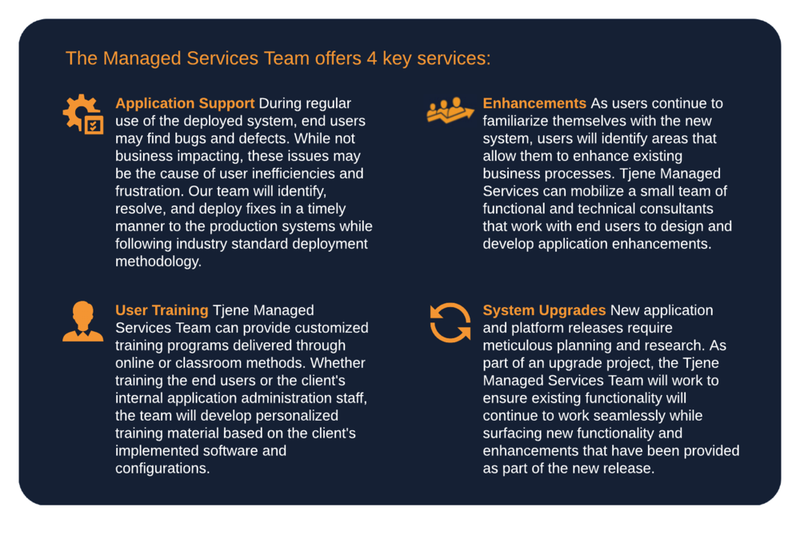 The Tjene Managed Services Team aims to provide our clients the post-implementation support to ensure speedy organizational acceptance and ROI of the system. Our Managed Services Team consists of experienced consultants and developers that work out of our local offices. The local offices allow the teams to work as a cohesive unit, regularly sharing best practices and developing skills through experience. This ensures that clients will receive expert support based on their business need as well as industry best practices through our experience at many clients. More data has been created in the last five years than ever before. It is more important now than ever that data is treated as one of enterprises’ most valuable assets. Cleaning data and maintaining data integrity is critical to creating a solid foundation of business intelligence. Tjene supports your organization’s data management by providing the right tools and expertise to handle your data assets. Tjene’s Extract, Transform, and Load (ETL) solution provides our clients the flexibility to extract their data from various source systems (Oracle, Microsoft, Access, Excel, flat files) into a single staging area to apply business and industry specific rules to blend the data. The end result is production ready, high quality data that is suitable for loading into the application.